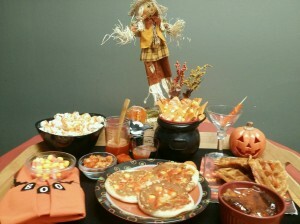 Did you know, according to Community Table, about 9 billion kernels of candy corn are sold annually? As a child I wasn’t a big candy corn fan. It was always part of a Halloween candy trade deal. Taste buds change, and mine sure have because I wouldn’t trade candy corn or my candy corn treats for anything…well, maybe for an extra-large caramel apple drizzled with chocolate! It’s almost Trick-or-Treat time. Halloween is one of my favorite holidays. It definitely proves the kid in me has never grown up. I love all things Halloween. I owe that to my mom, who made Halloween for my brother and me as exciting as Christmas. Mom was in the planning and making of our costumes and was always eager for another trip to the store for more fake blood– we could never have enough of that! She would take us Trick-or-Treating and then take the two of us and almost the entire neighborhood to a haunted house. My brother and I would get home, sit on the floor, and start bargaining our candy, “I’ll trade you two Sweetheart Packs for that Pixie Stix.” We would wheel and deal until we had the perfect treat bag. Our treat bags never contained any black licorice, however, because that always went to mom-her favorite. Halloween night always ended with a “trick” because you can’t have Trick-or-Treat without any tricks. Mom (to this day don’t know how on earth she found some of the tricks she did, it was way before Google or Amazon) would surprise us with a magic trinket or gag gift. I will never forget the fuzzy worm, attached to invisible string, that could crawl up your arm! Remember all the fun Candy Corn Treats I made last time? Popcorn, candy bars, bread pudding, swizzle sticks, maple syrup, pancakes, ice cream, lollipops, and brittle?! 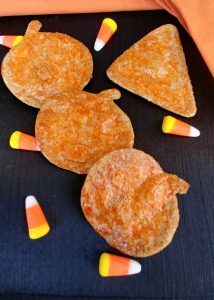 Well, I have a two new favorites: Candy Corn Coated Tortilla Chips and Roasted Candy Corn Nuts! 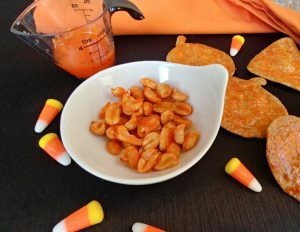 Both of these creations start with the magic orange potion of melted candy corn. *Recipe easily doubled for extra snacking. 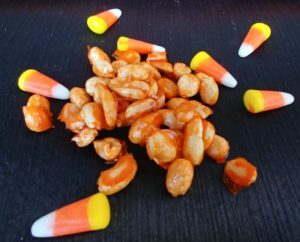 To make Candy Corn Peanuts: Toss peanuts (I like to use unsalted nuts) in candy liquid. Pour onto parchment lined baking sheet. Bake 350* for 10 minutes. Remove. Let cool. Candy will harden. If you like a thicker, chewier candy corn coating follow these directions here. These are for all my savory and sweet loving friends out there. Believe it or not, they are not too sweet. In fact, hubby gobbled them up quick and he is not a sweet eater or a candy corn lover. I love crispy chips and these fit the bill with the cracking candy coating. I used whole wheat tortillas for these chips. (Like to cut calories where I can especially during a candy eating holiday!) Use cookie cutters for fun cut-outs or use scissors to snip tortillas into shapes. Add candy corn and water to a glass container. Microwave for 30 seconds. Stir until smooth. Set aside. Cut out tortillas with cookie cutters or cut into triangles. Line a cookie sheet with parchment paper. Place cut tortillas on sheet. Spray with non-stick spray or olive oil. Bake for 5 minutes. Flip. Brush chips with candy corn glaze. Bake 5 additional minutes. Flip. Bake 5 more minutes. Put Your TO COOK IS TO CREATE Thinking Cap On: What else do you think would benefit from a candy corn coating? I haven’t tried cookies yet, but it’s on my list. Don’t forget about mixing it into ice cream, too. Try it on corn tortillas instead of flour tortillas for a crunchier chip. Not a peanut fan? Try an assortment of nuts or your favorite. Like snack mix? Toss with the melted candy corn and let cool. Candy corn coated pretzels are also a nice treat. Need more candy corn inspiration from breakfast to dessert? Don’t forget to check out my ten other uses for candy corn. 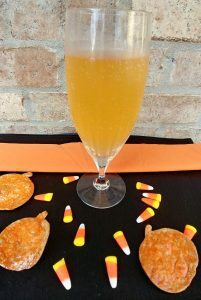 FOOD FUN: Here’s to a Happy Halloween to all: Candy Corn Champagne…move over mimosas! So amazing what can be created with candy corn. Most people LOVE candy corn…..my favorite too! Great treats especially to surprise the grandchildren when they visit.